Peña Nieto said Mexico still offers its friendship to the US, but he didn't confirm whether he plans to go ahead with his Jan. 31 meeting with Trump at the White House, the Guardian reports. 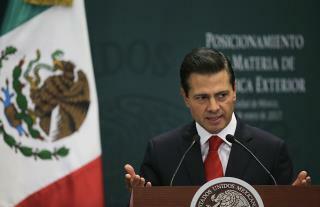 Senior government officials said late Wednesday that the Mexican leader is thinking about calling it off. CNN reports that Peña Nieto said he would wait for an evaluation from Mexican officials in the US before confirming the visit to the US. He also said he had ordered government agencies, including the 50 Mexican consulates in the US, to step up protection for immigrants. The Washington Post looks at five major challenges the wall project will face, including rough terrain and the fact that most land along the border in Texas is privately owned. In Mexico, people are furious and are calling for a stern response to Trump's plans, reports the New York Times. "It's like we are Charlie Brown and they are Lucy with the football," says former foreign minister Jorge Castaneda. "Peña is a weak president in a weak country at a weak moment, but he has to find a way to get some official backbone." Historians say the last president to anger Mexico this much was Calvin Coolidge, who threatened to invade "Soviet Mexico" in the 1920s. The Los Angeles Times looks at the details of the border wall project and other immigration-related actions Trump unveiled Wednesday. His plan to withhold federal grants from "sanctuary cities" like LA is expected to start legal battles that will last for years. • Mexican authorities must keep track of every single person in the country: – Federal, local and municipal police must cooperate with federal immigration authorities upon request, i.e., to assist in the arrests of illegal immigrants. (Article 73) – A National Population Registry keeps track of “every single individual who comprises the population of the country,” and verifies each individual’s identity. (Articles 85 and 86) The USA should adopt some of Mexico's laws against illegal immigration. • Under Mexican law, illegal immigration is a felony. The General Law on Population says, – “A penalty of up to two years in prison and a fine of three hundred to five thousand pesos will be imposed on the foreigner who enters the country illegally.” (Article 123) Foreigners who are deported from Mexico and attempt to re-enter the country without authorization can be imprisoned for up to 10 years. (Article 118) Foreigners who violate the terms of their visa may be sentenced to up to six years in prison (Articles 119, 120 and 121). Foreigners who misrepresent the terms of their visa while in Mexico — such as working with out a permit — can also be imprisoned. Foreigners who are deported from Mexico and attempt to re-enter the country without authorization can be imprisoned for up to 10 years. (Article 118) How Many Snowflakes think America is too tough on illegal aliens crossing into the USA now?